While many militia units can boast two generations of the same family in their history, the Andersons of Montreal can claim a proud history of service with The Royal Montreal Regiment that spanned five decades. The patriarch of the family, Major James Walter Anderson, joined the RMR in 1957 as a provisional second lieutenant after serving ten years in the Black Watch (RHR) of Canada. The then Sgt Anderson wanted a new challenge and he thought he could find it in the RMR. After first serving in the RMR’s ‘D’ Company, then located in St. Anne de Bellevue, Anderson, now 84, transferred to ‘B’ Company in the RMR armoury and served as a platoon commander. During the Cuban missile crisis of 1962, he spent eight months on full-time callout. His promotion to captain followed in due course and he commanded ‘A’ Company when that sub-unit was stood up in 1963. He was also adjutant of the RMR. When the RMR received its third stand of colours, from Governor General Georges Vanier on Sept. 20, 1964, Anderson commanded Number 1 Guard during the parade in Westmount Park. It was the 50th anniversary of the founding of the RMR, in August, 1914, and hundreds of RMR veterans were present from all eras. A reunion dinner for the veterans and serving members was held the night before. The Andersons started their service in Canada’s militia in 1904, when James Anderson’s father, Walter James Anderson, joined the 6th Duke of Connaught’s Royal Canadian Hussars as a teen-age trooper. The 6th Hussars was a rural unit and had several squadrons scattered around the Eastern Townships. Walter Anderson rode with ‘A’ Squadron, based in Havelock, Que. He later moved to Montreal and transferred to the 5th Regiment, Royal Highlanders of Canada, now the Black Watch. A year or two later, Walter Anderson found himself on course with one Charles Basil Price, a young NCO with the Victoria Rifles of Canada. The future MGen Price, of course, became the ‘father of the RMR,’ was the RMR’s first RSM, commanded the unit twice and was also the Honourary Colonel from 1943-57. Price also served as the President of Dominion Command, The Royal Canadian Legion. Sgt Walter Anderson mobilized for war with the Royal Highlanders’ 13th Battalion, Canadian Expeditionary Force, and went overseas. After accepting a commission in 1916, he went back to the trenches and received his third wound of the war during the battle of the Somme, in July, 1916. His brother Elmer served with the Canadian Engineers. A third Anderson brother, Austin, served with Walter in the 6th Hussars before the war. He didn’t go overseas the first time, but in the Second World War he served overseas in the Royal Canadian Artillery. Their nephew, Pte Kenneth Reeves, 16, was killed in action serving with the British army in the First World War. After the war, Walter Anderson later rejoined the Black Watch and served from 1930-46, retiring as a major. He started his second war as quartermaster of the Black Watch before serving in Farnham as a weapons training officer. He died in 1971, aged 85. The Andersons originally came from county Tyrone, Ireland and the maternal Middlemisses from Perth, Scotland. Both families emigrated to Canada in the mid-19th century. James Anderson’s maternal great-grandmother was Isabella Rollo. Her son, Capt John Rollo Middlemiss, was a land speculator and entrepreneur. He was also an original officer of the Victoria Rifles of Canada, circa 1862. James Anderson’s first memory of the militia occurred in 1933, when he was just three years old. His father had taken him to the Black Watch armoury on Bleury Street to attend a reception for Harry Lauder, the famous Scottish music-hall star. Trying his best to show the visitor some hospitality, the very young James offered Lauder a sandwich, only to be politely rejected! Now and then, the young James would accompany his father to the armoury and ‘help out.’ Standing proudly behind the counter in the quartermaster’s stores, the precocious nine-year-old would issue uniforms to the soldiers. He also liked shooting in the range in the armoury’s basement, and at Farnham. In fact, he started shooting the .303 Lee Enfield when he was 10. In 1943, aged 13, James Anderson joined the RMR’s Trinity Church cadets. His brother George was there as well and later became the corps RSM. Dressed in a uniform dating from the first war, including puttees worn from the ankle to the knee, the young James didn’t like it much. “I thought the drill was silly. The CO had us forming fours, like in the Boer War!” The CO, Capt Lowe, had served in the British army during that war. George Anderson joined the Black Watch aged 16 and trained as a RCAF flight engineer soon after, but he never made it overseas. In 1949, he joined the regular army and was commissioned in the Royal Canadian Ordnance Corps. Serving in Korea, Indo-China and Egypt with the United Nations, he retired as a major in 1949. Two of their cousins also served in the RCAF during the second war. Cpl Lyman Anderson Roberts served in North Africa and LAC James Anderson, 18, was killed on a training flight. Another cousin, Lt Rollo Hunter served in the Pacific as a submarine officer with the Royal Navy. James Anderson, who attended West Hill High School, followed his father into the Black Watch in 1947, aged 17. Two short years later, he was wearing the three stripes of a sergeant. In those days they moved you up quickly if you were good and James took to the life. Starting in the 1950s, he worked as a surveyor, draftsman and field manager for SNC Lavalin. Fifty years ago, the RMR, in common with every other militia unit, had many veterans from the Second World War still in uniform. The Warrant Officers and Sergeants’ Mess boasted a membership of around 40-50, while the Officers’ Mess had about two dozen members. Social life in the militia was very strong, with dances, balls, smokers, mess dinners and the like filling the social calendar. Then as now, there were a lot of characters in the unit’s three messes and sometimes people could act pretty outrageously. On one occasion, James Anderson remembers another officer, who was very keen on parachuting and the Airborne forces, being challenged by a British officer to put his money where his mouth was. The first officer exited the mess, climbed over the railing of the balcony and jumped. Upon landing he rolled properly, just like they teach you on the jump course. He certainly loved the Airborne and needless to say, no one else followed his example! In 1964, James Anderson convinced another cousin, Gordon Roberts, to join the RMR for the summer. The militia’s first student militia training plan was underway and the goal was to attract, train and hopefully keep students in their militia units. Gordon Roberts must have liked the RMR because he was on parade later that year when the unit received its third stand of colours, in Westmount Park, from Gov.-Gen. Georges Vanier. Afterwards, Gordon’s mother, Dorothy Roberts, was introduced to a former RMR commanding officer, LCol Robert Schwob. She mentioned that her brother, Gdsm GM McOuat, had served in the RMR during the Second World War before being killed in action on Mar. 27, 1945, as a member of the Governor General’s Foot Guards. The brass had decided that the RMR, then the 32nd Canadian Reconnaissance Regiment, was no longer needed and its soldiers had been allocated to various armoured units. Intrigued by her story, Schwob took her downstairs to the parade square and escorted her to the armoury’s north wall, where he took out the RMR’s book of remembrance from the memorial plaque. Sure enough, the name of Dorothy’s brother is inscribed in it. The Andersons continued their service with the RMR when James’ oldest son, Steve, joined the unit in 1968. He had served with the Royal Canadian Air Cadets in Brampton, Ont., then briefly with the Lorne Scots (Peel, Dufferin and Halton Regiment). Two years later, in 1970, he was a sergeant and on Sept. 1, 1971, Steve was promoted to warrant officer. He also served with the 51st Service Battalion, based at the old CFB St. Hubert near Montreal, before transferring to the regular force in 1978. He served in Lahr, Cold Lake and Trenton and deployed to Haiti and Macedonia as a UN peacekeeper. Steve Anderson retired from the air force in 1999 but rejoined as a reservist and served 11 years on callout with 8 Wing Trenton’s Construction Engineering as alert coordinator. He retired for the final time in 2011. Steve died on Jan. 9, 2012. One of Steve Anderson’s two sons, Mike, served a brief time in the Prince Edward and Hastings Regiment, circa 2000. His other son, Eric, is a police officer with Peel Regional Police, in Ontario. The second son of James Anderson, Robert, reached the rank of master warrant officer with the RMR cadets in the late 1960s. Back then, the RMR’s armoury had a two-lane bowling alley in the basement and Bob helped setting pins for the bowlers. He remembered Christmas parties for the children of the Regiment, with Santa Claus handing out presents (a tradition which is still observed to this day at the RMR, Santa Claus being the only other person ever allowed to sit in the RSM’s chair). When the time came, he followed his father and older brother into the RMR. Over the next 23 years, Bob Anderson became one of the most respected members of the RMR. He served as a section commander in ‘B’ Company and as an instructor teaching recruits in Depot. He was also in the transport section, the QM stores and in the signals section. For over two decades, Bob Anderson was one of the few rocks of the RMR, always there and always ready. In the Junior Ranks Club, also known as the Men’s Mess, Bob served in almost every position on the committee, including president, mess secretary and treasurer. Finally, on Nov. 7, 1993, standing tall on parade in the armoury in front of his peers, following that year’s Remembrance Day ceremony, he accepted a third stripe and moved upstairs to the Sergeants’ Mess. He retired from the RMR in 1995. Dave Anderson, James’ third and youngest son – there are also two daughters, Donna and Barbara – took the RMR’s summer recruit course in 1981 before transferring to the Air Force. Today, he is a major in RCAF intelligence and works at the Canadian Defence Academy, at CFB Kingston, Ont. “I joined the military in 1981, at 17 years old, as an aircraft avionics technician and worked as a tech until 2001, achieving the rank of sergeant. I commissioned in 2001 and transferred to the Intelligence Branch. I served in Greenwood, Baden, Trenton twice, Kingston twice, Petawawa and NDHQ. I have deployed to Qatar (Gulf War I), Bosnia and Afghanistan for two tours. I’m very proud of my family’s history in the Canadian Armed Forces,” said Dave Anderson. He noted that his grandfather Walter served in the Black Watch in WWI and WWII. “When I deployed to Afghanistan on my first tour my father said that my grandfather would be watching over me and taking care of me. That meant a lot to me. I will be retiring in June 2016 after 35 years,” he added. To sum up, starting in 1904, the Andersons contributed nine men in four generations, plus at least four cousins, to the service of sovereign and country for over 100 years, including almost the entire span of the 20th century. That is certainly an enviable record by any standard. Long may the Andersons flourish! Several other families have had more than one member in the RMR. For example, LCol Henry F. Hall, a former commanding officer, served with two brothers at the end of the 1960s. 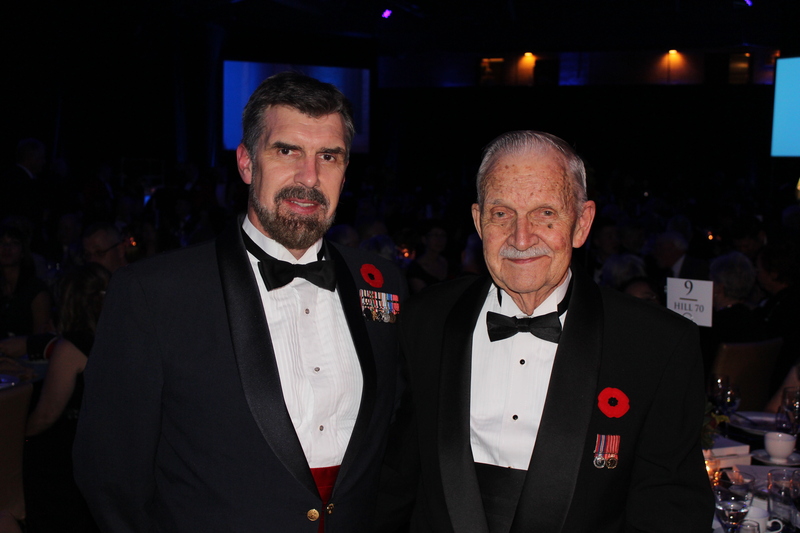 During the same era, an RSM of the RMR, CWO Ron Glen, served with his son, WO Ron Glen, Jr. The Slessor brothers followed their father’s footsteps into the RMR (Slessor senior having commanded the Regiment during WW2). At the moment, Maj Pino Talarico is serving with his two sons, Sgt Mike Talarico and Cpl Nick Talarico.